Looking for a grand old mountain lodge on the East Coast that serves up plenty of fun for a family weekend away? Skytop Lodge in Pennsylvania's Pocono Mountains offers families a wonderful chance to get away from it all and play in the Great Outdoors. The Poconos have long been a favorite playground for city slickers who yearn for some time in the country. By car, it's just under a two-hour drive northwest of New York City and just over two hours north of Philadelphia. 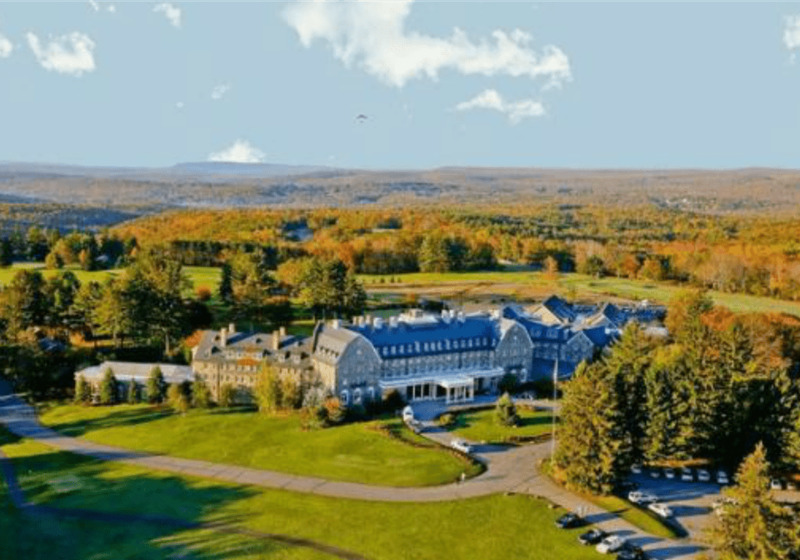 Centered around an enormous stone lodge, the resort has been welcoming guests since 1928 to its spectacular setting on a mountaintop plateau in the Poconos. The grounds are immense, comprising over 5,500 wooded acres that stretch far beyond what the eye can see. Most activities are found within a few acres of the lodge. Extensive facilities include riding stables, a golf course, an indoor and outdoor pool, basketball and tennis courts, croquet lawn, archery range, paintball field, geocaching circuit, driving range, playground, game room, spa, and fitness center. The lake provides swimming, fishing, kayaking, and canoeing in the summer and skating and ice fishing in the winter. In the winter, there is also snow tubing, dog sledding, skiing, and a terrific, old-fashioned toboggan run. There are many miles of hiking trails of varying difficulty and a clay shooting range. There is no supervised children's program but the resort offers a daily schedule of family-friendly activities, which may include guided nature walks, arts-and-crafts workshops, hay rides, yoga classes, scavenger hunts, trivia games, laser tag tournaments, and wildlife demonstrations. When the weather doesn't cooperate, alternative activities are offered. While undeniably historic and grand, Skytop Lodge isn't a luxury property. Rather, it has an atmosphere that is laid back, unstuffy and kid-friendly. Guest rooms feel upscale, but service is more slack than what you'd find at a luxury property. Most guests take advantage of the wide array of outdoor activities and dress casually. Dining options include the Windsor Room, the most formal option, which offers a buffet breakfast and lunch and a la carte dinner. Dress is casual except for weekend evenings, when men are required to wear jackets. Families looking for a more affordable option can dine in the Tap Room, a paneled pub serving soup, salad, sandwiches, burgers, and other casual fare. There's also the Tea Room, which serves sandwiches and hot dogs to go as well as ice cream, milkshakes and floats. Aside from dining in the main lodge, there are other restaurants at the inn and at the golf course. Rates can fluctuate significantly between high and low season. As you'd expect at a resort in the hinterlands of New York City and Philly, weekend rates are much higher than Sunday through Thursday. Rates during peak season can average $400 a night for a family of four, compared to $150 a night for a midweek shoulder season getaway. Wi-fi is free but there is a 15-percent resort fee (which can run anywhere from $25 to over $65 per night). Best rooms: Guests can stay in the lodge, inn, or a room in a cottage. Guest rooms are beautifully decorated and feature flatscreen TVs and modern bathrooms. Of the lodge's 125 guest rooms, the superior and suite room categories can accommodate a family of four. Larger and extended family groups should consider the Inn at Skytop, which contains 18 luxurious, connecting guest rooms with a fireplace, refrigerator and private balcony. There are also two executive suites that feature Jacuzzis. Another good bet for families is to stay in one of Skytop’s cottages, each of which is divided into four guest rooms. The double rooms can accommodate four people and feature a private bath, porch, small refrigerator and flatscreen TV with a VCR. Best season: The resort is open year-round, with a changing seasonal lineup of activities. Summer and school holidays are high season. To save money, aim for the shoulder seasons and check out the resort's special offers. Disclaimer: As is common in the travel industry, the writer was provided with complimentary services for review purposes. While it has not influenced this review, TripSavvy believes in full disclosure of all potential conflicts of interest. For more information, see our Ethics Policy.